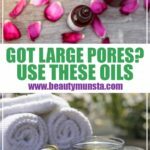 7 Best Essential Oils for Clogged Pores & How to Use Them - beautymunsta - free natural beauty hacks and more! 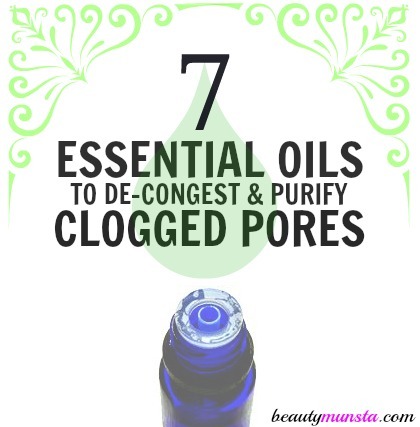 Check out the 7 best essential oils for clogged pores and how to use them in this article! The sebaceous glands (oil glands) just below the skin’s surface constantly secrete sebum which drives out dead cells, dirt, pollution and other impurities from within the pores by clinging to them. Sometimes buildup of these impurities cause blockages in the pores, leading to clogged pores and creating infection that causes whiteheads, blackheads and pimples. Impurities can accumulate on the skin due to a variety of reasons including not cleansing your face, sleeping with make-up on, too much pollution in the environment and others. 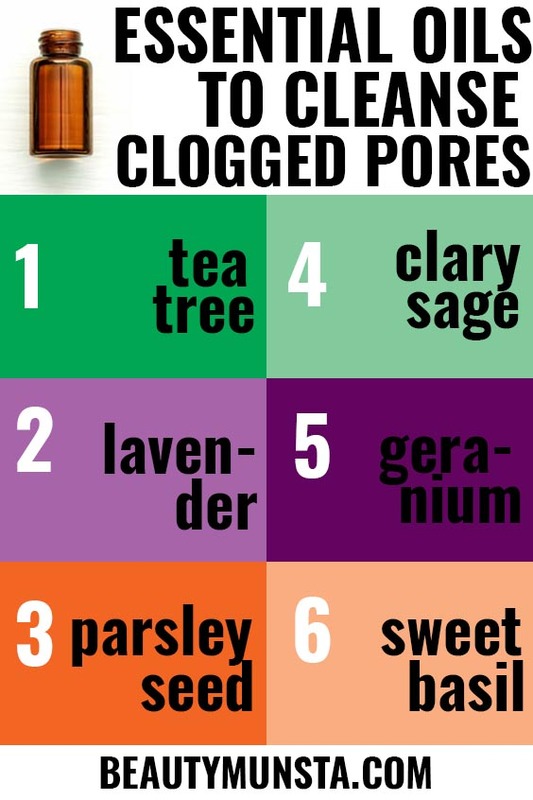 Clogged pores can also be caused by internal factors such as hormonal changes and eating too much of oily junk food. Certain essential oils have skin cleansing, purifying and detoxifying properties that help clear clogged pores and congested complexions. 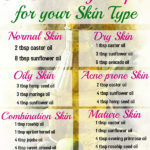 Below are 7 of the best essential oils for clogged pores and 3 effective recipes to help you de-congest your skin naturally! Tea tree essential oil is the best essential oil for clogged pores – its powerful disinfectant and skin cleansing properties drive out grime, stale sebum, germs, dirt and pollution stuck deep within the pores. It also has astringent properties that help rid the skin of excess oiliness that blocks pores and causes whiteheads, blackheads and pimples. 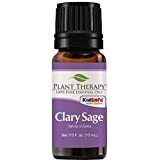 Clary sage essential oil is another one of the best essential oils for clogged pores and congested complexions. The name clary sage is derived from the Latin word claris which means clear. Clary sage essential oil has skin cleansing and balancing properties that help clear greasy skin as well as balance the skin’s natural pH. The name lavender comes from the Latin word lavare which means to wash. Lavender was used in ancient Rome in baths to cleanse the body. It has skin purifying properties that de-congest stuffed skin, driving out dirt, grime, dead cells and other impurities. 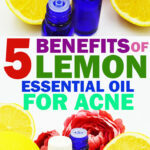 It also has skin soothing properties that relieve inflamed pores. 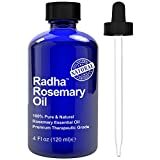 Rosemary essential oil gently detoxes congested skin by cleansing it from deep within the pores thereby preventing whiteheads, blackheads and pimples. It is also a powerful astringent which helps reduce skin oiliness and minimize large pores that secrete more sebum that ends up blocking pores. 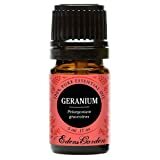 Geranium essential oil provides a myriad of benefits for skin including fighting acne, soothing eczema, preventing premature wrinkles and fine lines, fading scars and de-congesting clogged pores. It also has astringent properties that help minimize large pores that secrete excess sebum which ends up clogging pores. The same properties that make basil essential oil good for treating acne are the ones that help relieve clogged pores. These properties include skin cleansing, astringent, antiseptic and disinfectant properties. Below is a simple but super effective facial steaming recipe with basil to de-congest clogged pores. Parsley seed essential oil is extracted through steam distillation from parsley seeds and it’s an effective tonic for clogged pores and congested skin! 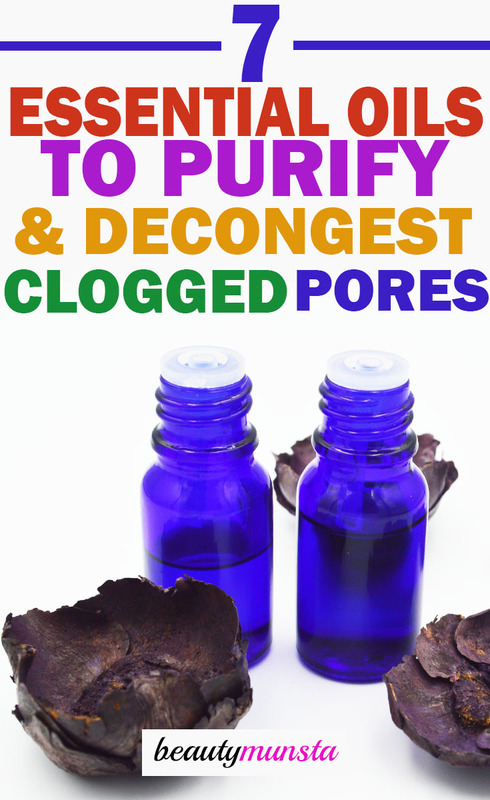 It has powerful detox properties that help in drawing out toxins and impurities from deep within the pores. 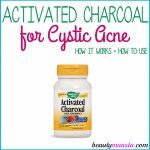 It also has antiseptic and antimicrobial properties that fight off bacteria and germs that clog pores and cause acne and blackheads. 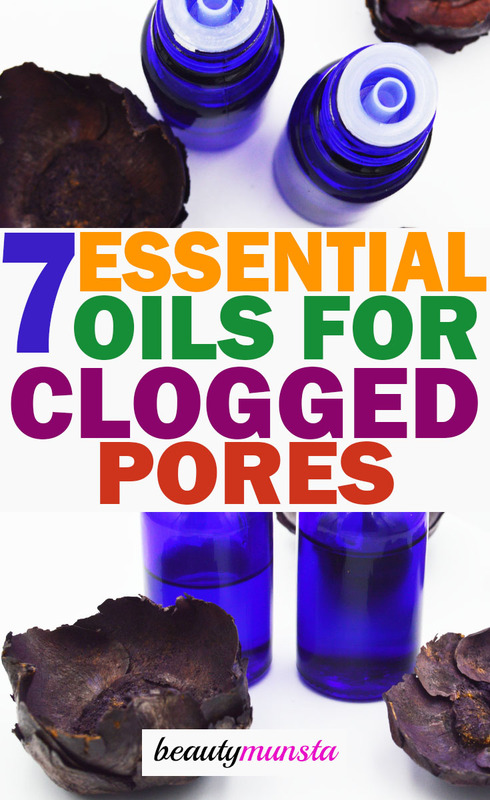 Now that we’ve covered the 7 best essential oils for clogged pores, let’s have a look at the most effective ways to use them to degunk your pores! Remove it from heat and place it on a flat surface. Add one to two drops of basil essential oil in the water. Sit down and hold your face as close as you can manage over the pot. Use a towel over you to trap steam. After steaming for about 5 to 10 minutes, wash your face with tepid water and unscented castile soap. In a foaming soap dispenser, pour in 1/4 cup of liquid castile soap. Use the help of a funnel. Add 5 drops of tea tree essential oil and 5 drops of lavender essential oil. Now add 1 tsp jojoba oil and 1/2 tsp vegetable glycerin. Fill the soap dispenser with 1/2 cup of distilled water. Close the bottle and gently shake to combine. Lather your face with this tea tree facial cleanser once/twice a day to deep cleanse clogged pores. Fill a 2 oz amber spray bottle with distilled water. Add 3 drops of rosemary essential oil and 3 drops of clary sage essential oil. Shake gently to combine. 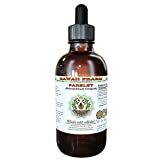 You may add just a tsp of witch hazel to emulsify the essential oils. Spritz onto your face after cleansing to tone your skin and balance sebum. Don’t forget to use a test patch first on your inner wrist or elbow to see if the essential oil is safe for you. If you experience any burning, itching or irritation within 24 hours, do not use the essential oil. Never ingest any essential oil and keep them away from children and pets as they are very potent and can be toxic. 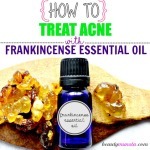 If you are pregnant or nursing and would like to use essential oils for clogged pores, please first consult your medical practitioner as most essential oils are not safe for pregnant or nursing mothers. People suffering from hypertension, asthma, epilepsy or any other serious or chronic health condition should first consult a doctor before using essential oils. Make sure to use only 100% pure essential oils.